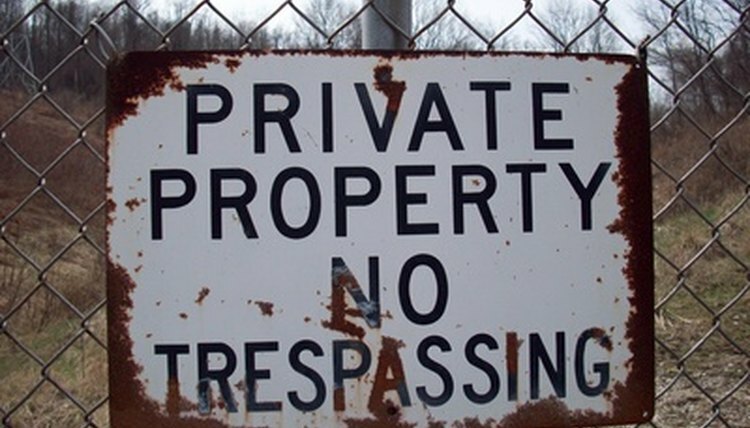 In Ontario, you can incur several penalties for trespassing. A sign does not have to be posted in order for you to be considered in violation of the Trespass to Property Act in this province. If you do not have implied or explicit permission to be on any given premises, then you are in violation of this act and can be arrested by a police officer -- even without a warrant. Under Ontario law, a police officer can arrest you for violating the Trespass to Property Act. The owner of the property upon which you are trespassing also has the lawful right to arrest you until a police officer arrives. How Long Does a Shoplifting Charge Stay on Your Record in California? If you are found guilty in a court of law of violating Ontario's Trespass to Property Act, fines of up to $2,000 can be assessed against you as of 2010. In the case of a first offense, however, fines are likely to be much lower than that. If a court of law determines that you are in violation of Ontario's Trespass to Property Act and that you have caused damages to the premises, you can be held responsible for paying damages of up to $1,000. This amount is on top of whatever fine has already been assessed. In court, the total amount that you could be responsible for under the Trespass to Property Act is $3,000. If the owner of the premises believes that damages exceed $1,000 or if he is not satisfied with the damages that were assessed in the original judgment, he has the right to take you to small claims court. There, he can seek additional damages from you. If you've been convicted under the Trespass to Property Act, this can be offered as evidence in court. If a property owner takes you to small claims court and wins a judgment against you, you may also be held responsible for the costs that he incurred in prosecuting you. The court will only rule in favor of this if the need for professional prosecution was warranted. If it is decided that legal counsel was not necessary, then you may not be held responsible for those costs under Ontario law. Ringwelski, Meaghan. "Penalty for Trespassing in Ontario." , https://legalbeagle.com/6384592-penalty-trespassing-ontario.html. Accessed 26 April 2019.